I know, I know, it’s the soul’s looking glass or something. All about the breath, corralling a busy mind. …like love and I really should be tending to my digital footprint right now — liking and not liking things as I see fit. But instead, I’m sitting here motionless. Just, staying. Like a cucked labrador. Maybe I’ll have Shake Shack for lunch. It goes on like this for as many exhales and inhales as I can muster. So needless to say, I’m skeptical when I pull into the parking lot of Just Float, “The World’s Largest Float Therapy Center,” which promises to support mindfulness and reduce anxiety, ease depression, improve sleep, increase immune function, lower blood pressure, improve spinal health and promote feelings of well-being by laying in a foot of lukewarm, extremely salty water for an hour. My skepticism only grows upon walking into a waiting room that’s being swallowed by Pac-Man-like circles. “Circles represent the wholeness, perfection and completeness of the Universe,” explains Anissa, a ray of sunshine greeting me at the front desk. Anissa invites me to step into a circle and watch a six-minute introductory video on an iPad. Everything is about to get better, the video promises. More sleep, less pain and a better outlook on life. Celestial music swells on the video as directives are ordered: I’m to strip totally naked and wash myself in an antechamber before stepping into the tank. Next, I’m to hit a button on the right. Slowly the lights will fade, and it will become dark and silent. She also asks me to sign a waiver acknowledging that I’m aware of the risks associated with floating. As we meander through the winding hallway, Anissa pauses outside the “Grooming Room,” which she explains is stocked with blow dryers, conditioners and other wellness sundries. “Couples will often come here together before going out afterward,” she explains. The benefits of float therapy are threefold, Anissa says, leading me to chamber number six, my home for the next 43 minutes. Epsom salts draw toxins from the body, she continues, while sedating the nervous system and relaxing the muscles. 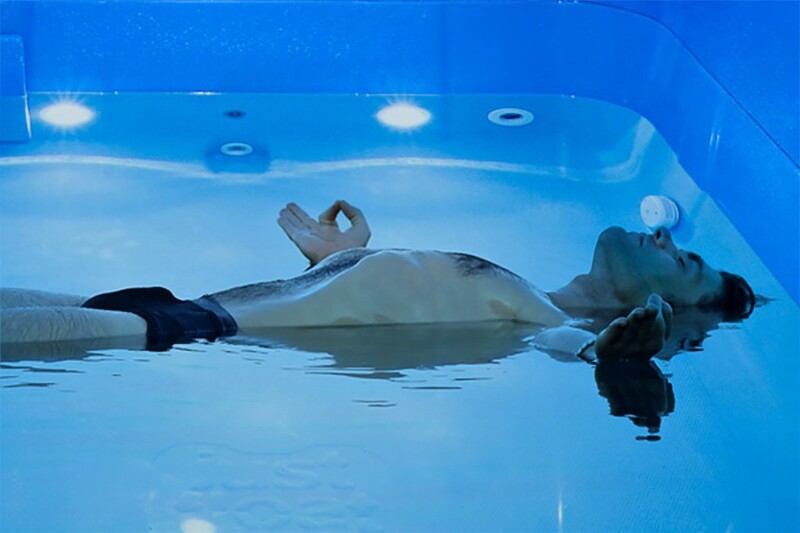 All the while, sensory deprivation shuts out external stimuli, calming the mind. Anissa hands me a blue flotation halo for my head, wishes me a good float and excuses herself. I disrobe, shower and wash my face, as directed, and check my watch. It’s 9:25 a.m. on a Saturday morning. No work. No engagements. No family members looking for me. No unlocked car — I triple-checked on my way in. I naturally drift into a splayed position, recalling Anissa’s suggestion: “Count down from 100, slowly, and gladly begin again if your mind wanders.” Gentle swells (are those Himalayan drums?) drift away, and the glow of light fades entirely — like the last three kilowatts of energy on the planet. Then, nothing. Complete darkness and silence, but for my breath. No one talking to me. No one needing anything from me. No unlocked car. I think this feeling, this weightlessness, is what we’re all really after. Certainly drug addicts like me. But it’s also the best part about swimming (the only good part?) — a brief respite from our clunky, always-too-heavy physical selves. I seem completely detached from my own body and am floating around in an alternate universe. I’ve felt this once before — the only time I shot heroin. It is only a matter of minutes — seconds, really — but I fall into the deepest sleep of my life. Parts of my brain shut down, briefly, for the first and only time. That’s when the Himalayan drums strike again. Maybe it’s a dream. Maybe it’s a hallucination. But they’re getting louder and louder. Then daybreak. The glow of ceiling light reappears, signifying my time’s up. I fix myself a cup of tea in the lounge, thumbing through the guest book again. Those hippy-dippy mantras I mocked moments earlier — Slow down, don’t hurry, don’t worry, trust the process — are making a lot more sense. That blissful, chilled-out state of Nirvana lasted residually for me for a couple hours, similar to the immediate aftermath of my morning workout. For several days afterward, in fact, it felt like the volume was turned down on my angsty mind. But what’s stayed with me most are those few moments of sleep, looking out the window into the lowest reaches of my brain. There, spying the rhythm of my life, I felt the flow of the promised sentience. Maybe best of all, though, there was nothing from the outside world that could interrupt it.